Slack is a team collaboration tool. Slack is an extremely popular way to receive messages from team members all in one place and integrate with external web services. One possible integration is with ThingSpeak. 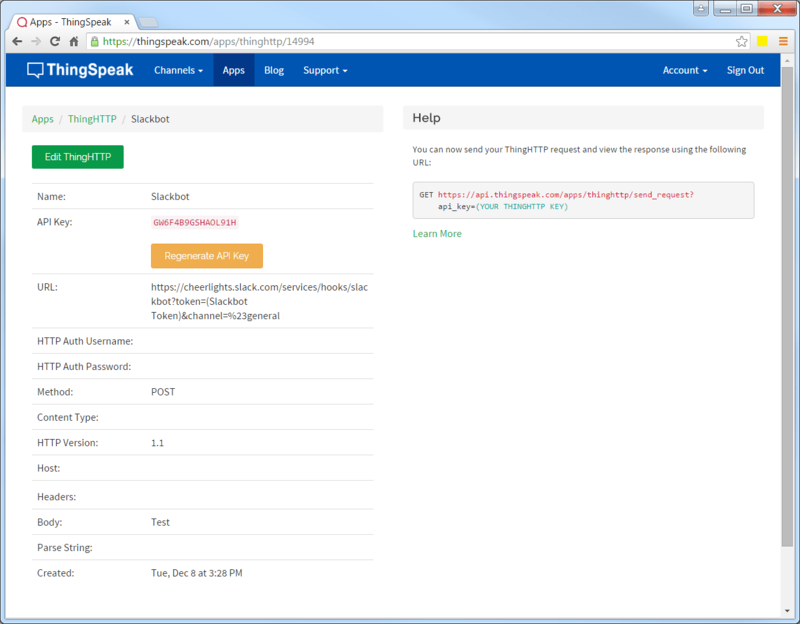 ThingSpeak is an open data platform for the Internet of Things. Devices all around the world are using ThingSpeak to collect data from sensors and send data to apps and other devices. By following this tutorial, you will be able to use ThingSpeak to send messages to your team’s Slack channel. This will also allow devices like an Arduino to use Slack since ThingSpeak will take care of authentication and HTTPS. ThingHTTP generates a URL that you can use HTTP GET from a device or other ThingSpeak Apps such as MATLAB or React. Enter the ThingHTTP URL in a new browser tab. You will see a response of “ok” if the request is successful. You will also see a new Slack message on your General channel.